The new album Umoya (titled from the Zulu word for life force), features rising star Samuel Eagles on sax and is one of the first wave of releases on the new jazz imprint from prestigious classical label Odradek Records. On this album, Clouts’ African inspirations extend beyond Cape jazz to Gnawa music and Afrobeat, and further to pan-European folksong, soul-jazz and even drum ‘n’ bass. Joined by saxophonist Samuel Eagles, bassist Alex Keen and Yamaha Jazz Scholarship-winning drummer Dave Ingamells, he brings his musical journey alive with superb musicianship and infectious vigour. The music of pianist-composer Philip Clouts combines jazz and world music influences, both of which have been integral throughout his musical life. 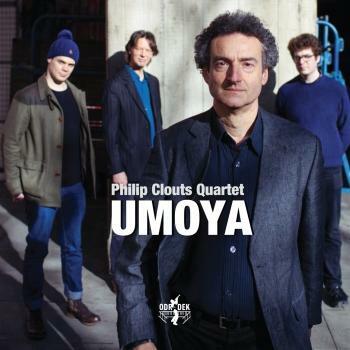 Philip Clouts is drawn to the freedom of jazz and to the rootedness of world music, genres which bring to his compositions both rhythmic vitality and stylistic diversity. Born in Cape Town, Philip Clouts has been particularly influenced by the immediacy of South African music. Umoya is the Zulu word for ‘life force’, and can also be translated as ‘soul’ and ‘spirit’. This word has become the title of one of Philip’s songs, and of this whole album. Yet the album is a melting-pot of wide-ranging influences: North African Sufi music, with its trance-like bass; Nigerian dance rhythms stemming from the Afrobeat style of Fela Kuti; European folk music from Italy and Romania; gospel; and, of course, jazz. Philip Clouts has performed at venues including Ronnie Scott’s, Symphony Hall, Birmingham, and the Womad and Glastonbury Festivals, receiving praise for his “consummate musicianship” (Musician Magazine). He is joined by acclaimed jazz musicians, saxophonist Samuel Eagles (who has been mentored by the likes of Jean Toussaint), Alex Keen on bass guitar, and Dave Ingamells on drums.